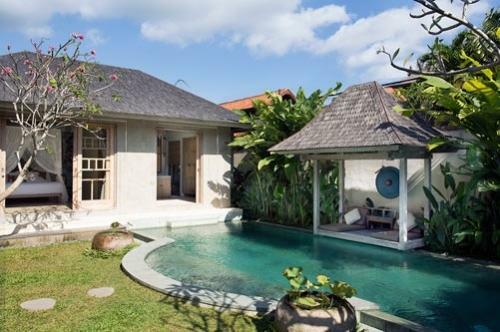 The vibrantly and stylishly decorated three-bedroom Villa 3526 lies in the secure and exclusive Laksmana estate at the heart of buzzing Seminyak, within walking distance of many of Bali’s best restaurants, cafes, shops and bars. 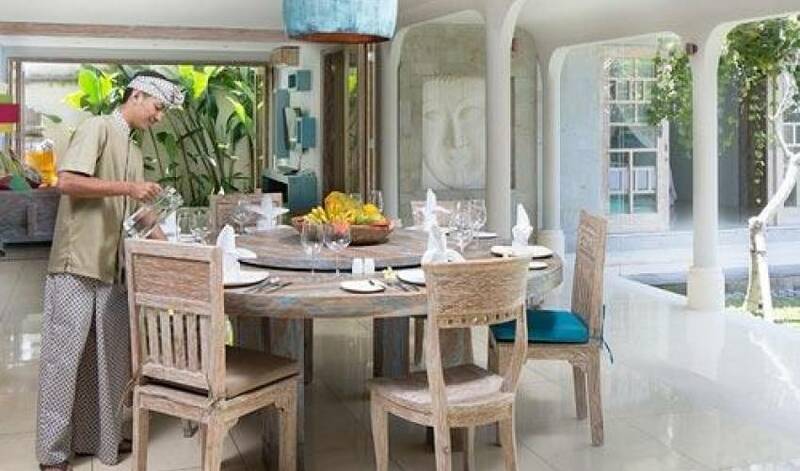 The villa’s charming and convivial living space includes a bright and airy open-plan kitchen, breakfast bar and dining area overlooking a lush tropical garden, 12-metre swimming pool and relaxation bale, and well-equipped TV lounge that can be opened to make one enormous living space or closed for air-conditioned comfort. 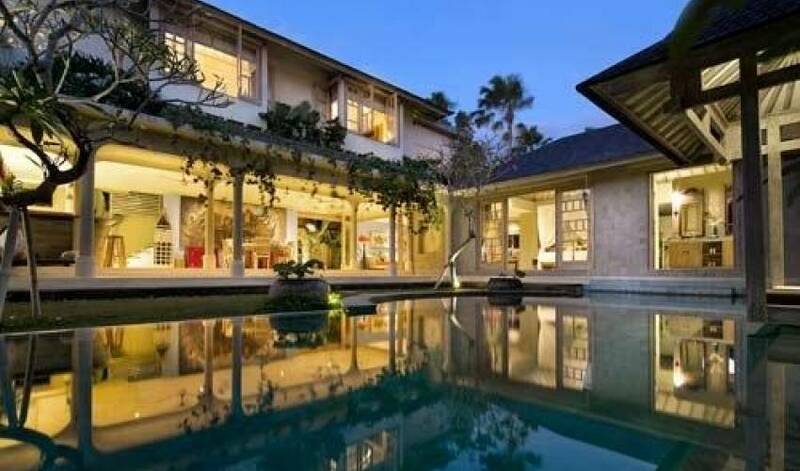 A capable team of staff is on hand to ensure that guests need concern themselves with nothing other than having a perfect Bali holiday. From the moment you enter Villa 3526, you know you’re in for something special. 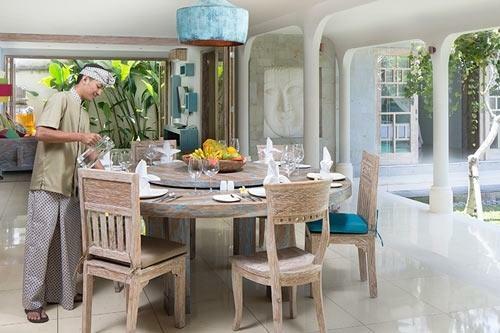 Everything from the statement art pieces and repurposed-boat-wood furniture, to the vibrant colour scheme and subtle mood lighting, highlights the incredible attention to detail, fun and flair that the owner has put in into creating this stylish three-bedroom villa. Start the day with a fresh fruit platter and a cappuccino at the breakfast bar. 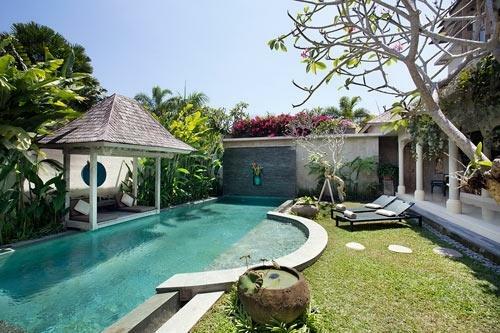 Later, chill out at the poolside – you have a choice of cushioned bale, sun lounger or beanbag – and enjoy the tropical garden resplendent with frangipani trees and bright pink bougainvillea. Retreat to the lounge and catch a movie or simply curl up with a good book. This comfortable room can be closed for air-conditioned comfort or opened to dining room and kitchen to make one big convivial living space. 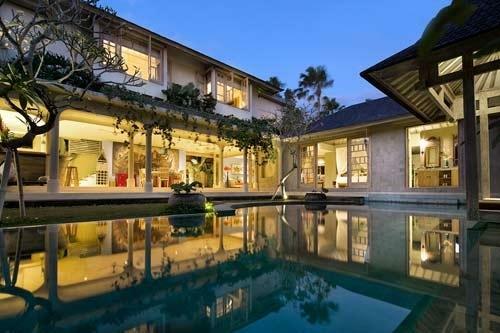 Tucked away in your private Bali oasis, it’s easy to forget that there is a world of entertainment at your doorstep – Seminyak’s iconic restaurants, hip cafes, first-class spas and unlimited shopping are all within walking distance, not to mention miles of sandy beach. 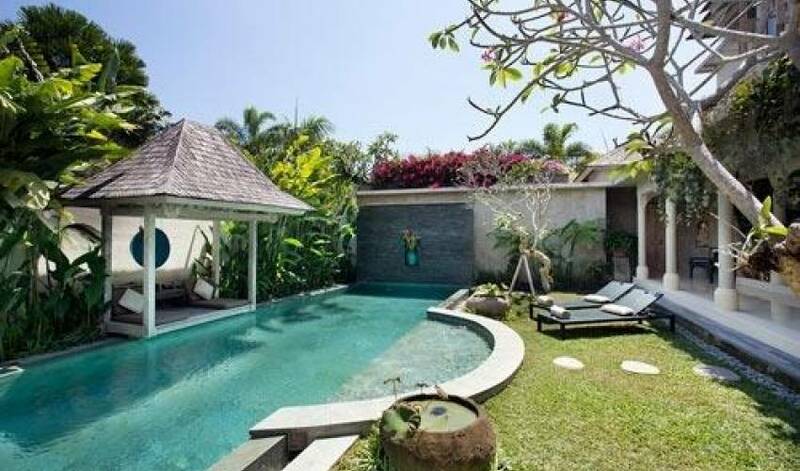 A stay at Villa 3526 offers you the best of Bali: the space and privacy of a unique and stylish villa, a team of professional staff to look after you, and all right at the very heart of cosmopolitan Seminyak. 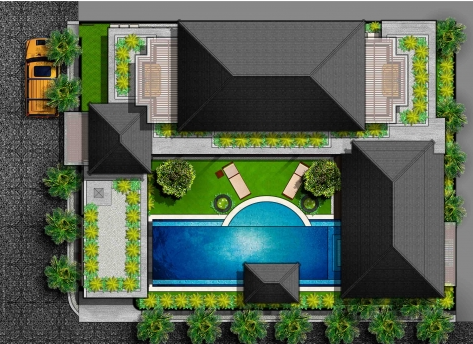 The villa’s 12-metre swimming pool and neat garden form the centrepiece around which the L-shaped villa is built. 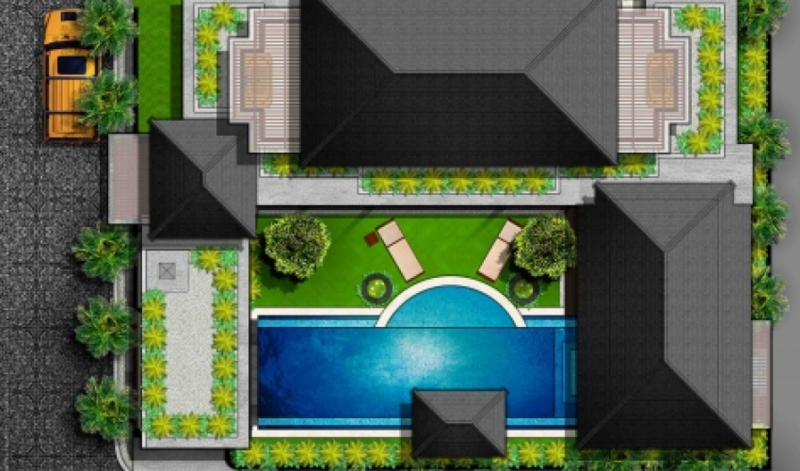 On the ground floor is an open-plan kitchen, breakfast bar and dining room, with a lounge at the far end which can be closed off with sliding glass doors or opened up to make one long living space. 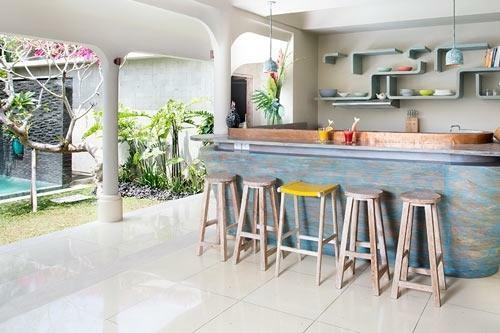 Villa 3526’s kitchen, breakfast bar and dining room are all open to the garden and pool area, creating a wonderfully tropical indoor/outdoor living space. 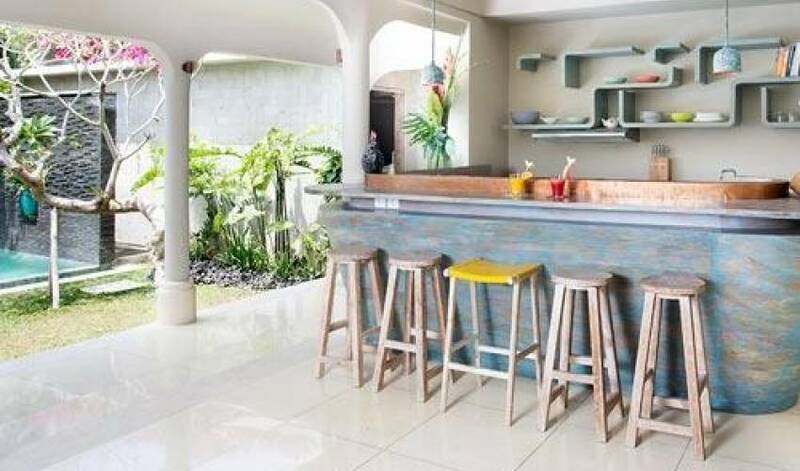 The breakfast bar is the place to perch, day or night: grab a coffee from the Nespresso machine and chat to the chef as he prepares your bacon and eggs at breakfast time, or pull up a stool and enjoy a icy cold beer or a cocktail at the end of the day. When dinner is served, move across to the lime-washed circular dining table where a ‘lazy Susan’ adds to the conviviality of the occasion. 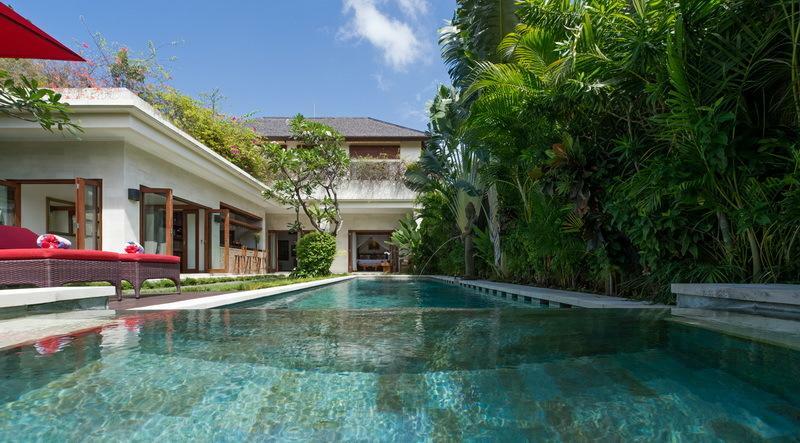 Sliding Chinese-style glass doors opening to the garden and pool, together with a soaring pitched roof, make Villa 3526’s spacious master bedroom wonderfully light and airy. This romantic air-conditioned room – also cooled with ceiling fan – is furnished with a king-size four-poster bed, equipped with a 42-inch satellite television, DVD player and iPod docking station, and features antique wood panels that open to reveal a tropical garden. The master’s enormous ensuite, finished in green terrazzo and surrounded by tropical plants, is fitted with a bath and rain shower. The villa’s two upper-floor guest bedrooms are accessed via a recycled ironwood staircase. These air-conditioned bedrooms are identical but for their striking individual colour schemes – one blue, one purple – and their unique decor. The blue room is furnished with twin beds (convertible to a king), while the purple room is king-bedded. Both rooms feature a lovely bay window, with built-in seating overlooking the garden and pool, and are equipped with satellite television, DVD player and iPod dock. Ensuite bathrooms are fitted with tubs and showers. 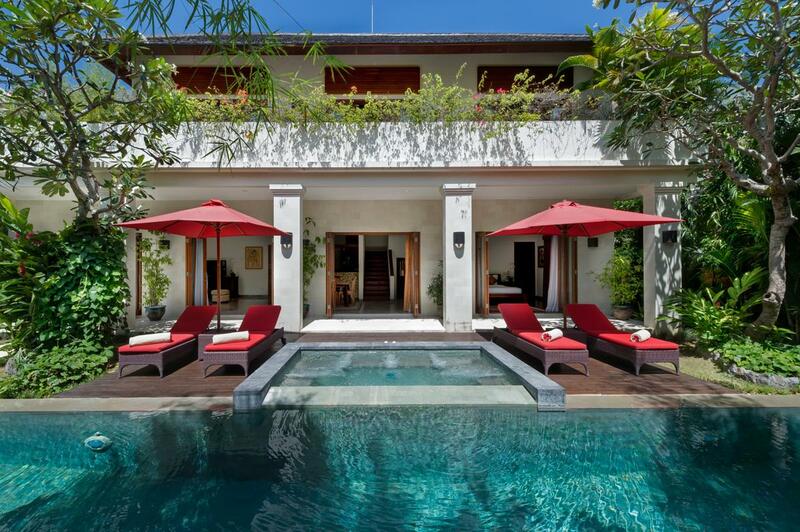 Villa 3526 is centrally located in the heart of Seminyak; perfect for those wanting to sample Bali’s best restaurants, bars, shopping and spas. 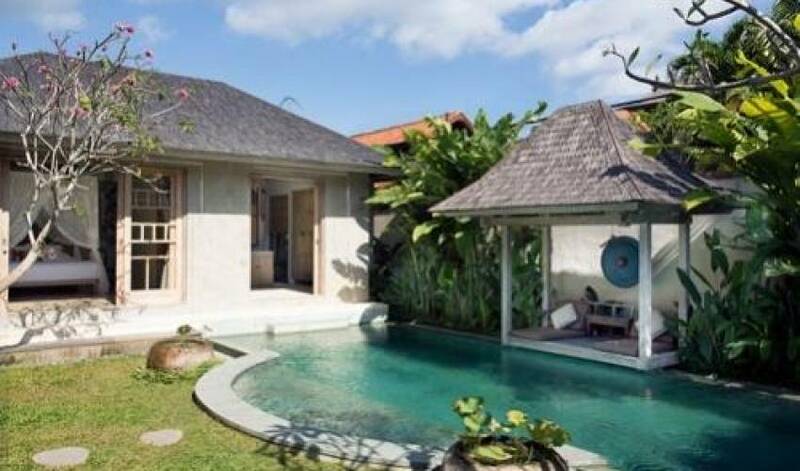 It’s just a short walk from the villa to the famous Bodyworks Day Spa, iconic Bali institutions such as La Lucciola and Ku De Ta, and some great cafes and restaurants (try Sea Circus, the newly opened Hotel Mexicola and Vin+). The sweeping sands of Petitenget beach are also within easy walking distance, as is the famed Petitenget temple, where vibrant beach ceremonies are often held.